I've become a little bit obsessed with finding bargains and unusual items in charity shops over the past few years. I like to think I'm pretty good at it, though you have to know where to go to get the right quality and types of clothes you're after. 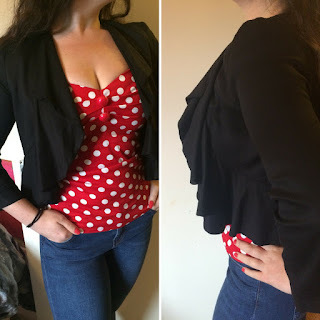 Charity shops are great for one-off and vintage items and whilst a few of the more savvy shops are catching on to things and beginning to price their clothes accordingly (fair play and good luck to them), if you can commit to sometimes rifling through rails of rubbish, you can certainly reap the rewards. As I did this month and was rewarded with an amazing selection of clothes - five items for the grand total of £13.50. Yes, the mathematicians among you will already have worked out that is an average of £2.70 per item of clothing. It's a no-brainer. So without further ado, may I introduce you to this month's charity shop haul. 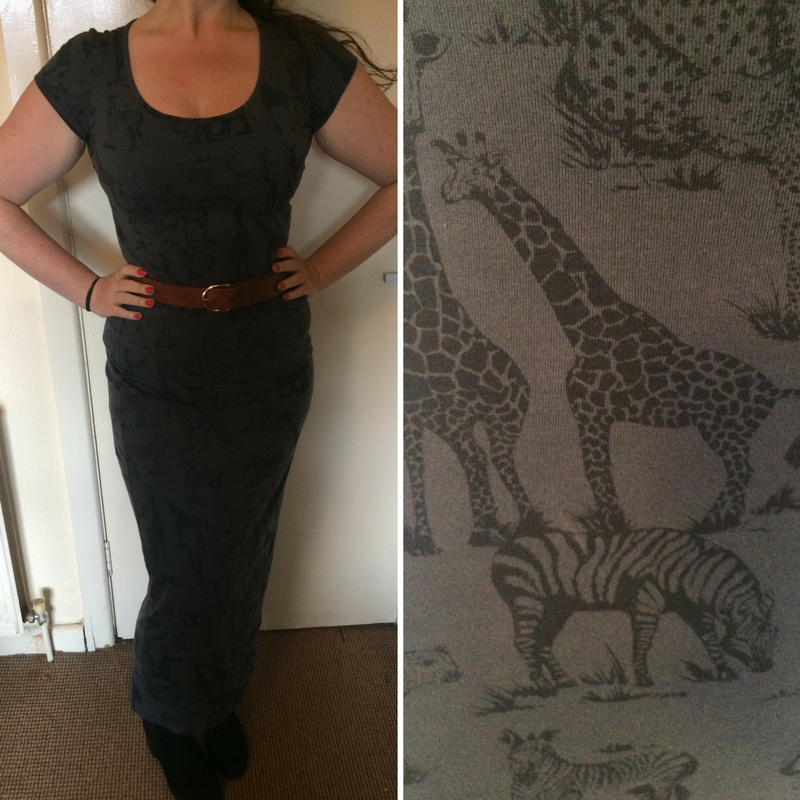 I actually found this gorgeous little number on the "bargain" rail in a charity shop, with it originally being priced at £4. I almost felt a little guilty taking it off heir hands but hey ho, I do donate a fair amount of my own stuff to charity, so it's fine. 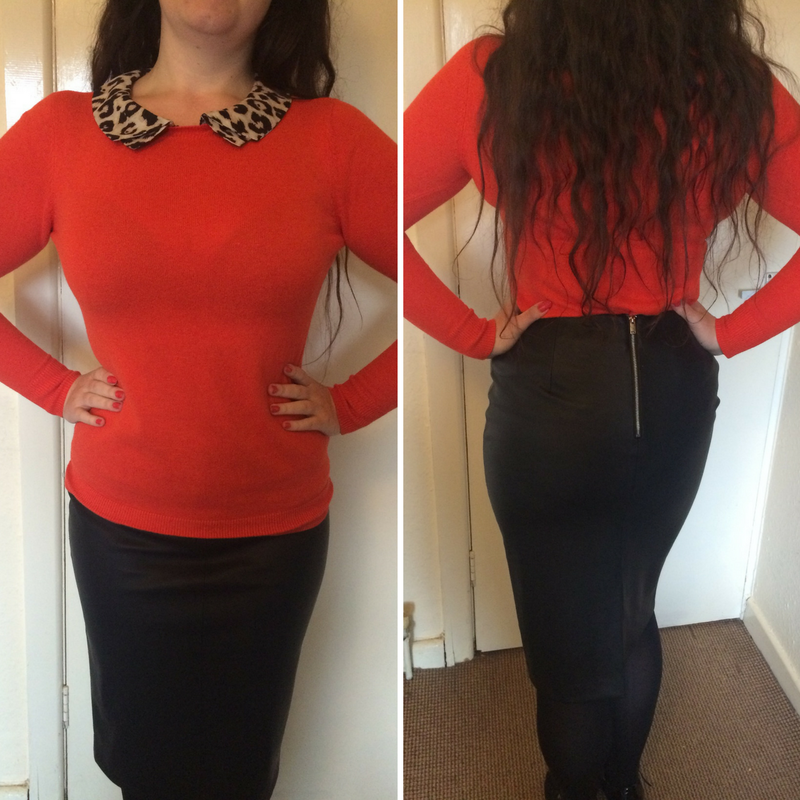 I love a bit of leather (or pleather) - I bought this Zara black leather pencil skirt i n South Africa. This tan colour is a bit more unusual and I can't wait to concoct an Autumnal outfit around it with patterned tights and my floppy felt hat. And right next to the Zara skirt was this cute little jacket, again for £2, reduced from. It's fairly light jacket so more suited to Autumn than Winter, but I'm sure I'll get some wear out of it both at work and play. I may even trow it on with the leather miniskirt above if I feel like it. Truth be told, I'm probably (definitely) more of a S than an XS really but when I tried on this bad boy in the changing room I thought it looked pretty OK. I actually remember wishing I'd bought this jumper with my staff discount during one of my two stints working there (think this was in store circa 2012/13) but didn't. Because minimum wage does not a large, lovely wardrobe make. Anyway, I was so pleased to see this and can't wait to wear it to work with one of my pencil skirts or maybe the high-waisted flared Phoebe trousers I got from House of London. Again, I'm definitely no size 8, but I just couldn't leave this amazing find behind. And the material is stretchy so I'll just find some big holdy-inny knickers to wear with it. Bridget Jones-style.Sorted.Whilst it doesn't quite display the Big Five (where's the love for buffalo people? ), the elephant, leopard, zebra and giraffe take me straight back to my trip of a lifetime to South Africa that I took in July (blog post pending). I'm very partial to a maxi dress in the summer but I feel the grey colour of this makes it suitable for Autumn / Winter wear too. This dress is a little summery for this time of year (isn't white usually) and I'm not sure it's currently the most flattering, however, I had the genius idea of dying it another colour. And the pinafore style is back in for this Autumn / Winter. Fact. So the question is, do I dye it a winter colour like forest green or burgundy and layer over a jumper / polo neck? Or do I dye it a more summery colour like lemon yellow? I was desperate to find a perfect yellow dress this summer. Either way, a great little find, IMO. That leather skirt is such a good find!! Thanks, I know - the leather is super-soft, too!